The ultimate haircare ritual for all blondes! A unique combination of potent Hyaluronic Acid and Edelweiss flower deeply nourishes the hair fibre and neutralises brassiness for an illuminated blonde. 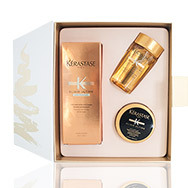 Protect and maintain long-lasting colour radiance with the Kérastase Reflection range. Without the right care, colour-treated hair can lose its vibrancy and can feel dry and brittle. 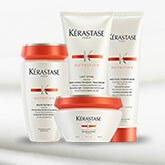 Kérastase Reflection range addresses all the haircare needs of colour-treated and highlighted hair. The Reflection range is enriched with Vitamin E, UV filters and chelators to help protect hair colour from external aggressors (sun, pollution, water particles) whilst Rice Bran Oil helps to enhance natural shine and colour vibrancy. Colour-treated hair needs extra care to maintain softness and nourishment. We recommend using the Chromatique Masque (for fine or thick hair) every week to replenish moisture to lengths and ends and keep your colour looking healthy. To maintain colour vibrancy in between salon visits, add Touche Chromatique to your Reflection Fondant or Masque. Touche Chromatique is the first personalised ink-in-care treatment for colour-treated hair. The ink dye helps to neutralise unwanted undertones and enhances hair colour. It can be used on natural or colour-treated hair. Choose Cool Blonde to neutralise yellow, brassy tones. Choose Cool Brown to neutralise red undertones. Choose Copper to revive copper shades. Choose Red to revive red shades. Touche Chromatique keeps colour and shine are protected and prolonged for up to 40 days. When it comes to colour-treated hair, hydration is essential. If your hair is naturally drier or chemical treatments and bleaching has stripped the moisture, we recommend opting for the Bain Riche and Masque Chromatique Epais. Kérastase Elixir Ultime is four precious oils - Maize, Pracaxi, Camellia and Argan. Infused into one stunning formula, the exceptionally versatile Elixir Ultime. A few drops of Elixir Ultime treatment leaves the hair feeling silky and looking lusciously shiny. Discover the power of Elixir Ultime's multi-action formula, developed to nourish, protect and beautify the hair. Adored by consumers, stylists, and beauty journalists, the range is ever-expanding, and has just released the New Oils collection: the legendary Oléo-Complexe is now blended with precious extracts selected with the utmost care to create Kérastase's most exquisite scented oils for your specific hair needs. For fine and sensitised hair, there is Elixir Ultime Millennium Rose; for damaged hair, Elixir Ultime Immortal Moringa; and for colour treated hair, Elixir Ultime Imperial Tea. For hair that appears shinier, bouncier and softer, discover Kérastase Chronologiste! If you don’t have a main concern with your hair, then Chronologiste is the perfect range for you! It provides all your hair and scalp need to be healthy, hydrated and protected. 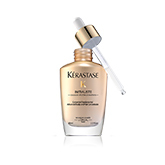 Kérastase Intialiste is an Advanced Scalp & Hair Concentrate. Developed with a unique combination of ingredients to protect stem cell environment, and make your hair grow thicker, shinier and most resistant. When using this product, it has also been shown that there is 93% less breakage of your hair. Your hair will begin to look the best your hair can be. 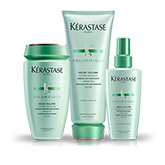 Kérastase Volumifique reinforces hair's internal structure for lasting body and hold. The lightweight formulas eliminates frizz and flyaway strands and boosts natural shine without weighing hair down. 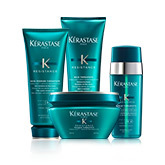 The Kérastase Homme range has been designed just for him. This Kérastase mens hair care range of products restores the look and feel of mens scalps and hair, from dandruff, to oil, to thinning control: there is a specialist shampoo and treatment to suit the needs of the everyday man's haircare needs. Taurine and d-biotine revitalise the hair, whilst ceramide and arginine fortify its fibres. 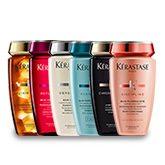 View all Kérastase Hair products in one place. For over 50 years Kérastase have led the way in advanced hair science, elevating haircare to the status normally reserved for high end luxury skin care. The key values of Kérastase remain the same today, Performance, Expertise and Personalisation. Their innovative formulas have truly transformed the way we treat our hair. 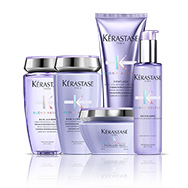 Initially a salon only brand offering professional diagnoses for all hair concerns, Kérastase transformed into a luxurious range of products with unique fragrances and sensual textures that clients could enjoy at home. A bespoke Kérastase haircare ritual, tailored to individual hair needs to recreate that personal salon experience. Kérastase continue to harness the finest ingredients and engineer the most effective formulas and therefore, remain the first choice for many salons and stylists across the globe. See why model Toni Garrn loves the natural haircare range, Aura Botanica. An easy tutorial on how to get the perfect braided updo. See what your hair language says about you. For over 50 years Kérastase have led the way in advanced hair science, elevating haircare to the status normally reserved for high end luxury skin care. The key values of Kérastase remain the same today, Performance, Expertise and Personalisation. Their innovative formulas have truly transformed the way we treat our hair. 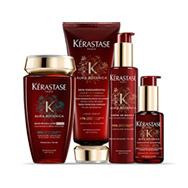 Initially a salon only brand offering professional diagnoses for all hair concerns, Kérastase products transformed into a luxurious range with unique fragrances and sensual textures that clients could enjoy at home. A bespoke Kérastase haircare ritual, tailored to individual hair needs to recreate that personal salon experience. Kérastase hair products continue to harness the finest ingredients and engineer the most effective formulas and therefore, remain the first choice for many salons and stylists across the globe. Kérastase believes that every woman craves and deserves exceptional hair, full of health, vitality and incredible shine. But as no women is the same, neither is her hair, and Kérastase addresses the variables of hair type, texture, scalp concerns as well and internal and external factors to ensure that with their expertise, Kérastase products can restore and maintain an individual’s hair to its optimum condition. 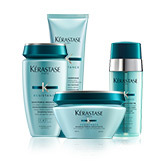 The signature 1,2,3 hair care routine of Cleanse, Treat and Prime is the cornerstone of the Kérastase ritual. From enhanced cleansing shampoos, known as “bain” to the ever-popular conditioning treatment “Lait Vital”, with its exceptional light texture and nourishing properties; to the strengthening ability of “Ciment Thermique” that smooths and repairs whilst minimising further damage from blow drying. Nutritive continues to be a bestselling range, as the go to solution for nourishing all levels of dry hair, from slight to severe, there are products within the Nutritive range tailored just for you. Key nutrients are delivered to the hair shaft, moisture levels are replenished, hair is left supple and irresistibly soft to the touch. Nutritive is perfect for anyone wanting to restore health and shine to their hair. Kérastase Reflection range with its innovative Systeme Capture Advance technology helps to neutralise the external aggressors that can disrupt hair colour. Rice Bran Oil work to enhance light refraction, to provide incredible long lasting shine. UV filters protect from sun damage whilst Vitamin E provides strength and nourishment. To boost your colour further, try Touche Chromatique, an ink in care product to blend with your favourite Reflection conditioning treatment, either Fondant Chromatique for fine hair or Masque Chromatique for thick hair. This will gently revive your colour, whilst being true to the shade, and ensure colour is even by neutralising unwanted tones. If you want to maintain your vibrant, glossy, rich salon colours for longer, then reach for Reflection. Aura Botanica is Kérastase's latest innovation With high levels (98%) of ingredients from natural origins but still with the outstanding performance we have come to expect from Kérastase . Kérastase have developed formulas that are more respectful to the natural world, and determined to lower their environmental impact, have chosen ingredients for Aura Botanica that have a high biodegradability (average of 97%) Not only that, but Kérastase has committed to support the wellbeing of the communities that harvest the key ingredients for Aura Botanica, and by bringing revenue to the indigenous communities their unique cultures can be preserved. The Kérastase shampoo within the Aura Botanica range is developed with micellar technology that gently cleanses the hair leaving a light, airy feel. Coconut Oil is the main ingredient in the Aura Botanica range, used for its ability to penetrate and nourish deep into the hair shaft, to provide long lasting hydration. Argan oil has proved a popular ingredient in hair care for many years, due to its fluid texture and rich concentrations of omega 6 and 9, that give the hair incredible softness and shine. Sourced in Morocco as well as Iris root, another key ingredient in the Aura Botanica range. Achieve ultimate levels of shine with the powerful blend of 4 precious oils in this iconic Elixir Ultime range. Tailored to your hair type these luxurious oils will deeply nourish and illuminate hair, yet never weigh it down. Bestselling Kérastase Elixir Ultime Versatile Beautifying Oil Treatment, is the stand out product that customers adore, for reducing the appearance of split ends, fighting frizz and humidity and for the beautiful healthy shine it gives to their hair. For fine hair in need of a boost, Volumifique offers the solution. Elevating roots to give fine hair a thicker appearance, try Kérastase Volumifique Expansion Spray, for added oompf! Tame unmanageable frizz or define your natural curls with Kerastase Discipline range. The luxury hair care range, created with the highest concentration of unique ingredients, to revitalise all hair types from scalp to ends. For those that desire beautifully nourished hair with lightweight shine and a soft velvet touch. For enviable lightweight shine choose Cristalliste. A regimen of silicone free, paraben free products designed for longer hair, whether thick or fine, to leave hair purified, and weightless. For hair that is thinning and lacking fullness, the Densifique regimen replenishes hair strands with Hyaluronic Acid and Kérastase's patented Intra-Cyclane® technology to plump and moisturise the hair shaft whist shielding from further stress enhancing their thickness to boost the density of your hair, creating more volume and body.